Five years ago, delivering food aid was all about hauling cargoes of wheat, rice and maize around the world. Today, instead of queuing for rations, recipients are quite likely to be given the means to buy their own food. As the cash transfer sector matures, IRIN spoke to experts to discuss the latest innovations and lessons learned. 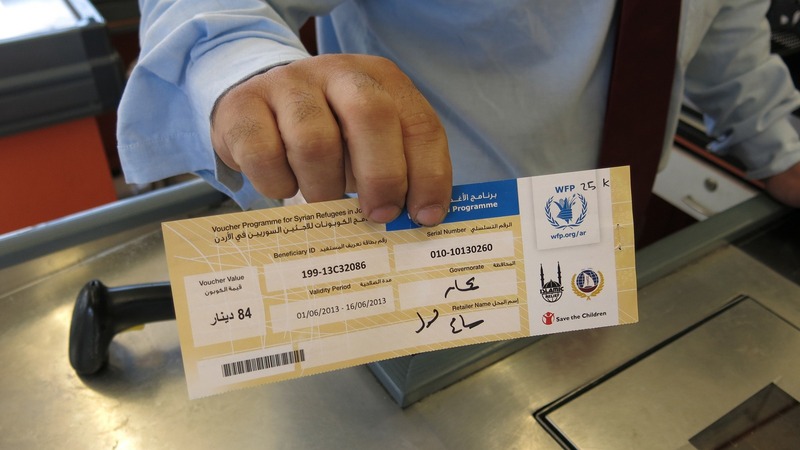 One third of all World Food Programme (WFP) food assistance is now given in the form of cash or vouchers, but cash transfers go beyond food. The current refugee operation in the Middle East is a test bed for cash assistance, for food but also for winter heating payments, help with rent and all kinds of other needs. And the beneficiaries are just as likely to get their money loaded electronically onto various kinds of plastic cards. In Turkey, Jordan and Lebanon, like other upper or middle income countries, there has been a move in recent years away from physical cash and towards different kinds of cashless, electronic payment. The world of humanitarian assistance has to keep up. The current dynamism of the cash assistance sector has been made visible by a new online tool from the Cash Learning Partnership (CaLP), a “Cash Atlas”, which was presented to the Humanitarian Innovation Conference at Oxford University earlier this month. So far they have logged 514 projects with more than 18 million beneficiaries. A series of filters allow the data to be shown by donor, by sector, by implementing organization, by means of delivery and so on. They show that food security is by far the biggest sector, the European Union (EU) and the UK Department for International Development (DFID) the most enthusiastic donors, and Oxfam, World Vision, Action Against Hunger and the Red Cross the biggest implementing partners. East Africa is the region where there are the most beneficiaries. There obviously are still places where you can't send cash. Two of WFP's three biggest emergency operations at the moment (South Sudan and the Central African Republic) still involve trucking in physical food to relieve serious shortages. But the beneficiaries of the third largest programme - refugees in Jordan, Lebanon and Turkey - are living in countries with all the attributes of a functioning modern state - banks, cash machines and supermarkets, and the ability to import food as needed to meet demand. These refugees get vouchers which can be spent in normal shops, and exchanged for any food item apart from sweets and fizzy drinks. A review of ten years of cash transfer programming by CaLP reveals that the bulk of cash transfer programming (CTP) remains at a small-scale, the biggest barriers to scale-up being its acceptance, institutionalization and implementation across the humanitarian community. To scale up CTP meaningfully, agencies will have to change the way they go about everything from assessments to human resources, notes the review. “There are now a bewildering range of ways to send money - by cheque or bank transfer, smart cards or prepaid cards, paper or electronic vouchers, or even as good, old-fashioned cash. Despite all the exciting new possibilities, 7 million of the 18.5 million people who received transfers recorded by Cash Atlas still got their money the old-fashioned way. East Africa is the region which has led the world in phone-based “mobile money” systems, and it is also the region making most use of phone transfers, with Oxfam, the International Committee of the Red Cross and Concern all using phones to get help to their beneficiaries. Foster also worries about the more vulnerable in general. “In terms of exclusion, there are still some elderly or disabled people who can't make it to an agent, and also people like immigrants, or anyone undocumented, because these systems all require some recent form of documentation. In one of the trials, up to 26 percent of the recipients had to use nominees, other people, to collect the money for them because they couldn't access the service.” The risk is that, while phone transfers are cheap and convenient for the implementing agencies, they could just shift the costs and risks further down the chain, onto people less able to bear them. Mobile phone transfers are appropriate for rural Kenya, where conventional banks are thin on the ground. But the many agencies serving refugees in Jordan have a range of potential partners in the banking and retail sectors. Researchers from Britain's Overseas Development Institute who looked at these partnerships ended up making a strong plea for rationalization. It would make sense if all the agencies could all use the same system. The June CTP review recommended improving coordination on cash transfers by agreeing a place - an agency or network - to coordinate cash transfers in the humanitarian architecture. But as ECHO's Julia Stewart-David told IRIN, adopting one CTP system would have far-reaching implications for the way aid is delivered. The question is: is the humanitarian sector ready?